In recent weeks, Belarus managed to noticeably upgrade the level of its relations with EU countries. However, the ministerial-level meetings have been limited to Belarus’ long-time sympathisers in Europe (Hungary and Slovenia) as well as its closest neighbours (Poland). The relations with the United States have maintained their positive dynamics but remained at the expert level. The embassy row with Israel has ended with a victory of Belarusian diplomats. On 16–17 March, Belarus' foreign minister Vladimir Makei paid an official visit to Hungary. The Belarusian foreign ministry made no prior announcement of the visit. It released its first communiqué when Makei almost exhausted his agenda in Budapest. Makei had talks with his Hungarian counterpart, Péter Szijjártó, and met high government and parliamentary officials as well as potential investors. Belarus and Hungary focused on the ways to develop economic cooperation, with priority attention given to agriculture and food processing, mechanical engineering, pharmaceuticals, construction, telecommunications and tourism. Belarus seeks to play the card of Hungary’s independent position towards Brussels on several policy issues, including the EU’s relations with Belarus and Russia. Makei: "Any state's task... is to find legal ways of circumventing sanctions"
Makei and Hungarian politicians favour pragmatism and prioritise economic interests over human rights and democracy considerations. In his interview to a conservative Hungarian daily, the Belarusian minister advocated search for “legal ways of circumventing sanctions”, referring to the EU and Russia's reciprocal embargoes. Today's atmosphere of bilateral relations is prone to higher-level contacts between Belarus and Hungary. One should not exclude a possibility of a meeting between Alexander Lukashenka and Viktor Orbán in 2016. On 25 March, Slovenia’s foreign minister Karl Erjavec visited Belarus accompanied by representatives of eleven Slovenian companies in a bid to strengthen bilateral relations and look for new economic opportunities. The Slovenian politician met his Belarusian counterpart and was received by President Alexander Lukashenka. The identified priorities in economic cooperation match those in relations between Belarus and Hungary, with addition of power industry. Erjavec attended the opening of the transformer station in Minsk build by Slovenia’s civil engineering giant, Riko Group. In presence of the two countries’ foreign ministers, Riko Group signed new cooperation agreements with local energy agencies. In February 2012, Slovenia vetoed the introduction of the EU’s sanctions against Yury Chyzh, a Belarusian oligarch who was then closely linked with Alexander Lukashenka (but recently detained). At that time, Riko Group was implementing a large construction project in Belarus with one of Chyzh’s companies. Alexander Lukashenka did not fail to thank the Slovenian diplomat for the “position, which Slovenia [had] taken in recent years on Belarus, in particular, when discussing problems with the EU”. In between his encounters with the regime’s probably strongest allies in the EU, on 22-23 March, Vladimir Makei welcomed in Minsk Poland’s foreign minister Witold Waszczykowski. President Alexander Lukashenka also received the Polish official. While trade and investment relations have kept their traditionally important place in the bilateral dialogue, the parties discussed other issues extensively. Belarus and Poland seek to further reinforce their shared border and agreed to seek financing from the EU funds while the security of the EU’s external borders remained a hot topic in European capitals. Poland would like to see progress in the treatment of Polish minority in Belarus. The Polish government also worries about the situation of the Catholic Church in Belarus, especially regarding the status of Polish clergy in the country. Alexander Lukashenka reassured Waszczykowski about his intention to guarantee equal rights of all ethnic groups and creeds in the country. Vladimir Makei also mentioned the two countries’ “willingness to seek mutually beneficial solutions to absolutely all issues, including the most sensitive ones”. However, one should not expect a quick progress on the matters involving human rights and democratic freedoms in Belarus. The Belarusian authorities manage very well to use these issues as a bargaining tool in a prolonged diplomatic game. On 28-30 March, Michael Carpenter, US deputy assistant secretary of defence, visited Minsk to meet Alexander Lukashenka, Vladimir Makei and Belarus’ defence minister Andrei Ravkov. Carpenter is a top expert of the US department of defence for the ex-USSR. However, his strictly mid-level position in a bureaucratic hierarchy would preclude his direct talks with top government officials in most other countries. However, lately Lukashenka chooses to disregard such subtleties. The US expert focused on bilateral relations with Belarus in the security and defence areas as well as on the situation in neighbouring Ukraine. Lukashenka used this opportunity to reiterate his earlier calls for a greater US involvement in the resolution of the crisis around Ukraine. In dissonance with Russian politicians, the Belarusian president admitted that he was not inclined to demonise NATO’s expansion eastward and to think that NATO was going to wage a war against Russia or Belarus. The Belarusian leader also chose to talk with the security expert about expanding economic ties between Belarus and the United States. Belarus and Israel are close to a full resolution of the recent embassy row. The situation in bilateral relations quickly deteriorated in early January when Israel announced the imminent closure of its embassy in Minsk. Belarus immediately retaliated by announcing the symmetrical withdrawal of its mission in Tel Aviv. Within a few weeks, influential Israeli politicians began sending repeated signals that their government’s decision would most likely be revoked. However, the Belarusian foreign ministry refused to suspend measures directed at phasing out its diplomatic presence in Israel. Several diplomats returned to Minsk. The embassy suspended some consular services. Even the publication of the decision to maintain the embassy on the Israeli government's web site failed to satisfy Belarusian diplomats. Only after having received a formal notification from Israel’s foreign ministry in late March, the Belarusian foreign ministry admitted that it got formal grounds for reconsidering the issue of Belarus’ diplomatic presence in Tel Aviv. Belarusian diplomacy has scored another victory in already the second embassy row with Israel. This time, a more resolute retaliation led to a much quicker restoration of status quo. If you happened to be in Minsk on 4 April, you should have picked up your free ticket to the public reading of the play “Seven”. The acclaimed documentary play tells the true stories of seven brave women from around the world who fought and managed to significantly improve the lives of girls and women in their respective countries. Artistic value aside the production has a very powerful political and social message. In Belarus public servants, experts, business, media and sports stars came together to give voices to the seven characters. And while the settings may be exotic – stories from Guatemala, Nigeria, and Cambodia – the narratives translate well into the Belarusian context: domestic violence, trafficking in persons, fighting for freedom and equality. The performance should ideally resonate with the local audience and lead to rigorous discussions. Belarus joins 32 other countries who have already staged “Seven" translating the script into their respective languages. Written by American playwrights, produced by a Swede, it aims to raise awareness about women's rights in the world by engaging local prominent people as readers of the monologues. It presents a tapestry of stories that include fighting domestic violence in Russia, rescuing girls from human trafficking in Cambodia, and promoting peace and equality in Northern Ireland among others. The first closed reading of Seven in Belarus took place on 2 November, 2015. The carefully chosen stellar cast of readers included Alena Kupchyna, Deputy Minister of Foreign Affairs, Aleh Karazei, representing Ministry of the Interior, Aliaksandr Rumak, Deputy Minister of Labour and Social Protection, Kiryl Rudy, Aide to the President of the Republic of Belarus, and His Excellency Martin Oberg, Ambassador of Sweden to Belarus among others. And this is where the play gets both politically and socially interesting. Amazingly enough rather high-ranking public servants agreed to act on stage. This meant adjusting their busy schedules to accommodate rehearsals. This also implies coming under the guidance of an artistic director, albeit as talented and outstanding as Ivan Pinigin. And on top of it all it may be the first time since the diplomatic row in 2012 that the government representatives of Sweden and Belarus play together, literally and figuratively. It happened so that during the second “expert” reading of the play I spoke with the voice of Marina Pisklakova-Parker, who founded the first hotline for victims of domestic violence in Russia in 1993. My organisation opened such a hotline 20 years later in Belarus with the support from the UN in 2013. However, neither Russia nor Belarus has adopted the legislation on domestic violence prevention yet. It remains a huge issue, which affects women from all walks of life, regardless of their education and place of residence. Two more performances will take place until the end of 2016, one of them in Hrodna region. Belarusian society could definitely benefit juxtaposing and discussing the issues brought up in the play. Domestic violence continues to be a widespread crime. According to the United Nations Population Fund (UNFPA) statistics every fourth woman in Belarus experienced some form of violence or aggression from the partner within her lifetime. And yet, only 29% of women survivors of physical or sexual violence choose to tell their story to lawyers, doctors or law enforcement. This low number testifies to the fact that the society has a high tolerance for violence, and women choose to suffer in silence. The number also reflects the lack of trust that women have towards state-provided services. The Ministry of Labour, responsible for rehabilitation services to victims, claims the existence and availability of 105 ‘crisis’ rooms nationally. In reality, however, very few of them admit domestic violence survivors. The overwhelming red tape, lack of respective protocols, and outright ignorance on behalf of personnel makes such services virtually unattainable for women. One of the few consistently operating shelters for domestic violence survivors in Minsk receives funding from abroad, namely from a private UK citizen. Altogether four NGO-run shelters for domestic violence survivors in 2014 admitted as many clients as all 105 of the state-sponsored together. Another prominent Belarusian women's NGO "Gender Perspectives" operates the only national toll free hotline for domestic violence survivors in Belarus. Since its launch in 2013 it has accepted over 8000 phone calls. They, too, completely rely on foreign and private funding. Belarusian Ministry of Foreign Affairs prides itself in introducing international initiatives against trafficking in human beings. Namely, it successfully created a Group of Friends United Against Human Trafficking at the UN in 2010. It also introduced a UN resolution on improving the coordination of efforts against human trafficking. Belarus has capitalised and will continue to do so on such initiatives. Such actions become a potent way of inserting itself into the international arena. Unfortunately all too often domestic efforts in human trafficking prevention lack lustre. US Department of State 2015 Trafficking in Persons report downgraded Belarus to Tier 3: “Countries whose governments do not fully comply with the minimum standards and are not making significant efforts to do so.” The Belarusian government places significant efforts on law enforcement and prosecution components, while the victim rehabilitation services are yet again scarce. 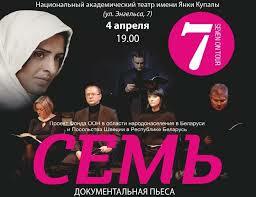 Belarus could definitely do more for women who find themselves in similar situations as the play's seven characters. While a play is a great happening in itself, the ultimate goal should be to use it as a potent tool for driving the changes in respective areas. It could help spearhead much-needed legislation on domestic violence prevention, or expand the opportunities for women’s NGOs, or empower real women. Or alternatively it may sadly remain a great foreign-funded story about women being successful against all odds.